At its height, the boundaries of the Roman Empire stretched from the north of England across the North Sea, along the Rhine and Danube Rivers to the Caspian Sea, south to Egypt, along the coast of Africa to Spain. The decline and eventual collapse of this vast empire took place over a period of years before reaching its bitter end in the middle of the 5th century. Its demise followed a pattern in which extended periods of weakness were followed by unsustainable bursts of strength that inevitably led to further decline. The forces that motivated its destruction came from the internal decay of its economic, political and social structure combined with relentless barbarian attacks from without. The Huns made their first appearance in what is now Eastern Europe around the year 370. Thundering out of Asia's Central Steppes, their arrival pushed the resident tribes such as the Vandals and Visigoths westward into a collision with the Roman Empire (see Dining with Attila the Hun). In 376, the Visigoths crossed the Danube River - a traditional boundary of the Roman Empire - and swarmed southward. Two years later, the Visigoths defeated the Romans at the battle of Adrianople, further weakening the Empire. 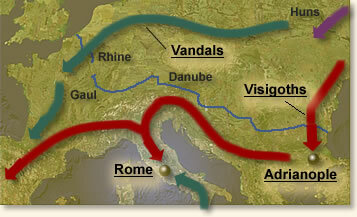 Further west, the Vandals crossed the Rhine River - another traditional boundary of the Empire- in 406. They continued their assault southward to Spain, crossing the Pyrenees Mountains in 409. A year later, the Visigoths sacked Rome and continued on to Spain. In 429, the Vandals crossed the Strait of Gibraltar and reached the shores of Africa. They continued their assault eastward along the coast and re-crossed the Mediterranean to make a landing in Italy. In 455 they followed in the footsteps of the Visigoths and sacked Rome. The Western Roman Empire was dead. However, a vestige of Rome lived on. Its Eastern portion, with its capital at Constantinople, lasted for another 1000 years until the city was sacked by the Muslims in 1453. "Nations innumerable and most savage have invaded all Gaul. The Whole region between the Alps and the Pyrenees, the ocean and the Rhine, has been devastated by the Quadi, the Vandals, the Sarmati, the Alani, the Gepidae, the hostile Heruli, the Saxons, the Burgundians, the Alemanni, and the Pahnonians. Oh wretched Empire! Mayence [Mainz, Germany], formerly so noble a city, has been taken and ruined, and in the church many thousands of men have been massacred. Worms [Germany] has been destroyed after a long siege. Rheims, that powerful city, Amiens, Arras, Speyer [Germany], Strasburg, - all have seen their citizens led away captive into Germany. Aquitaine and the provinces of Lyons and Narbonne, all save a few towns, have been depopulated; and these the sword threatens without, while hunger ravages within. I cannot speak without tears of Toulouse, which the merits of the holy Bishop Exuperius have prevailed so far to save from destruction. Spain, even, is in daily terror lest it perish, remembering the invasion of the Cimbri; and whatsoever the other provinces have suffered once, they continue to suffer in their fear. I will keep silence concerning the rest, lest I seem to despair of the mercy of God. For a long time, from the Black Sea to the Julian Alps, those things which are ours have not been ours; and for thirty years, since the Danube boundary was broken, war has been waged in the very midst of the Roman Empire. Our tears are dried by old age. Except a few old men, all were born in captivity and siege, and do not desire the liberty they never knew. Who could believe that Rome, built upon the conquest of the whole world, would fall to the ground? That the mother herself would become the tomb of her peoples? That all the regions of the East, of Africa and Egypt, once ruled by the queenly city, would be filled with troops of slaves and handmaidens? That to-day holy Bethlehem should shelter men and women of noble birth, who once abounded in wealth and are now beggars?" This eyewitness account appears in Robinson, James Harvey, Readings in European History (1906); Duruy, Victor, History of Rome and of the Roman People, vol VIII (1883). "The Fall of Rome" EyeWitness to History, www.eyewitnesstohistory.com (2007).